Arizona ophthalmologist Dr. Patrick Aiello grew up in Detroit, Michigan and received his B.A. in Chinese language and literature and his MD degree from the University of Michigan in Ann Arbor. After completing both an Internship and Residency in Internal Medicine at the University of North Carolina in Chapel Hill, Dr. Aiello finished a Residency in Ophthalmology at the world renowned Mayo Clinic in Rochester, Minnesota. 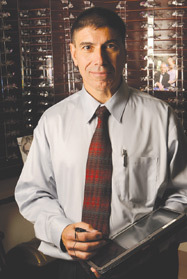 Dr. Aiello is board certified in both Internal medicine and Ophthalmology. Dr. Aiello is a trusted eye surgeon who is regarded by his patients as a skillful and compassionate doctor. To learn more about Dr. Aiello, request an appointment or call (928) 782-1980 to speak with one of our eye care professionals. Dr. Aiello is retired from the US Air Force and Air National Guard, with more than 27 years of service. He holds the retired rank of Colonel. He was formerly the Arizona State Air Surgeon as well as the Commander of the 161st Medical Group. Dr. Aiello is very well respected by his peers. He is a Senior Examiner for the American Board of Ophthalmology, the certification authority for ophthalmologists in the United States and Canada. He is an active member of the American Medical Association, the American Academy of Ophthalmology and the American Society of Cataract and Refractive Surgery. Dr. Aiello has lived in Arizona since 1992 and is regarded as one of Arizona's leading ophthalmologists and eye surgeons. He specializes in cataract surgery, refractive surgery, and general ophthalmology. He has performed more than 30,000 surgeries, making him one of the countries most experienced eye surgeons. To see a complete list of Dr. Aiello's achievements, view his curriculum vitae. Dr. Aiello's good nature, compassion and conservative practice style has earned him the respect and loyalty of both his colleagues and patients throughout his career. Dr. Aiello moved to Yuma, Arizona in order to open his own private practice in February of 2009 and is dedicated to providing high quality, comprehensive medical-surgical eye care to his patients utilizing the finest and most contemporary technology available. Dr. Aiello takes great pride in providing his patients with the care he would afford to his own family members and loved ones. We appreciate your confidence in referring friends and family members. Read what our patients say about Dr. Aiello at www.DrPatrickAielloReviews.com.